﻿Also available as limited vinyl edition! New music and groove – does it work and does it exist? Musical crossover artist Ketan Bhatti thinks so. 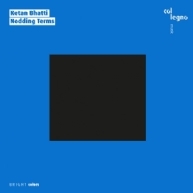 On “Nodding Terms” he melds contemporary chamber music with current club music. 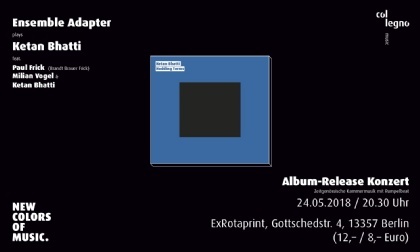 To this end, the composer, drummer and producer invited the German-Icelandic Ensemble Adapter into his studio and involved his studio neighbours Paul Frick and Jan Brauer from Brandt Brauer Frick in the production process. The musicians all studied classical instruments and know about pop. So acoustic traces become electronic tracks in a wondrous way. Dry grooves ow into iridescent shimmering ensemble sounds. The borders between genres and styles blur and dissolve. This is music which without fail makes the listener nod along – as per the album title. Not just because of its beat, but because it’s clever, too. The concept of mimesis is only meaningful if a behaviour of the [...] subject exists which confronts the world, the other, an object, a landscape or a course of events, in a way which is at once alien and distinct, but at the same time not completely distinct. Without a residual magic or “mimétisme“[...] (that is, an ability to approximate the other), there would be no art. What interests me is the intermediate area where tonal events can no longer be attributed to a particular genre or style. This intermediate area is by definition non-puristic and therefore sealed off from expertise. So my relationship to all genres, musical languages, disciplines or cultures is always a mimetic one – imitative and tentative. This imitation, however, holds an innovative potential for me, as a “transformation” is always included within imitation, preventing it from being merely a copy. So Nodding Terms does not represent a kind of juxtaposition of influences from urban club music and contemporary classical music, as in the case of a musical quotation, for example. Instead, I practice floating between the areas; working towards an ever more individual aesthetic, which seeks to overcome the class war between music as entertainment and music as art. The “borderland” here, claimed by so many for themselves, should not depict an undialectical juxtaposition of different styles, but must truly become a confrontation, a convergence, a fusion and thus a melting pot for the new. Ketan Bhatti was born in New Delhi in 1981, grew up in Bielefeld, and now lives in Berlin, where he writes music for theatre and dance (including for the Deutsches Theater Berlin and Schauspiel Köln), as well as musicals (in cooperation with authors such as Feridun Zaimoglu and Roland Schimmelpfennig). Together with his brother Vivan Bhatti, he has produced and composed music for many years for productions of the Berlin breakdance group Flying Steps, which tours internationally. 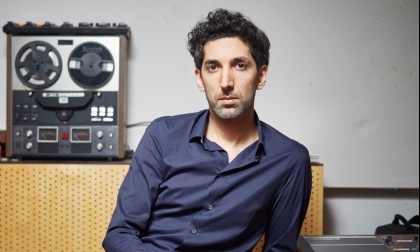 The “Flying Bach” production, for which the Bhatti brothers produced a hip-hop adaption of Bach’s The Well-Tempered Clavier, was awarded the Echo Klassik Special Prize. 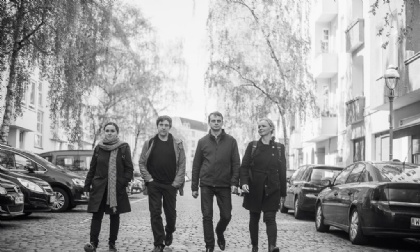 Adapter is a German-Icelandic ensemble for contemporary music based in Berlin. The core of the group consists of a quartet with flute, clarinet, harp and percussion. Together with steady guest instrumentalists this core grows into chamber music settings with up to 10 players. On international concert tours and in the studio Adapter plays world premieres and other selected works of the recent past. The ensemble also produces and co-produces larger interdisciplinary projects – and is interested in exploring and testing the limits of transmedial approaches in various settings. In workshops Adapter transfers knowledge of how to write, study and per- form contemporary music to composers, instrumentalist and creatives worldwide. Adapter stays in touch with the latest developments in the differing scenes of contemporary creation - maintaining a progressive, authentic and powerful style.